Thank You John for the great analysis. I think when people figure out that GLD and SLV are not really backed by all the gold and silver – the miners will be much more popular. It is good to support the miners because they need to bring more gold up to the surface. It is said that we are going into a “Golden Age”, literally meaning that there will be more gold on earth and that the spiritual and enlightening qualities of gold will be appreciated as gold becomes more abundant. I do own some silver – on shorter-term charts we look close to a break-out, but if the USD catches a bid again, I will forget that. FWIW, I just read the morning note from Julius Bär – they just opened short on gold with a target of 1000. Gold is going to $50-$60,000 within 20 years maximum. The miners & gold go up sharply in relatively short periods, and we’re just about to start one of those. That 32 16 32 8 etc looks awefully arbitrary. We can data snoop for other seemingly interesting patterns if we wanted to but i leave that detail to the aspiring data dredgers. In regard to miners it is about finding the gems amongst the mountain of garbage. There is heaps of garbage but definitely some gems that will be paying dividends alone in a few years, at multiples of their current share prices. Allan, for newbie gold mining investor, would you include GDXJ as being in the garbage category? And if so, are there any stocks within GDX or GDXJ that you would consider the pick of the litter? The job report yesterday was not good. The official unemployment number is 5,3 but there are now a record number of 93.6 mln Americans – in the right age- that have given up on finding a job. On a population of 309 mln that’s 30%. Together with the official unemployed total unemployement is close to 36%- and rising. On top of that the number of permanent jobs goes down. Every month the number of temporary jobs goes up. And wages are flat. And then the fantastic jobcreation of 280.000 last month was just a wish (or lie); the real number was 230.000. So this months number will certainly be revised downwards next month. Is this about definitions? No. People without a job – either registered of not – don’t buy houses, don’t buy cars and so on. In an economy that depends on consumer spending that is very bad news. The business results that will be published next week simply can’t be good. Only the ‘rent-a-tent’ companies ares going great as more Americans than ever live in one. The GDP number last quarter was supported by a huge increase in inventory. Any thoughts what that will do to the q2 GDP? Not the story the FED will tell you; bur this is reality. July 8th the Gann panic window opens. Mars still OOB and still within a severe moonwobble period. Andre, I saw a really bright star last night, it would have been in the South West I reckon, looked huge. Any idea what that is? Spot on re the data you mention, there is reality, and it does not correlate with mainstream media fiction (as relayed here by some). Yes, there was another smaller light just to the right. Thanks, wish I had a telescope. GM and A’, Venus and Jupiter together in the sky is awesome. Each night until 8/15 the bright star Venus will fall in the sky until it and sun will rise and set together. That is why it is called the morning and evening star; half time it rises before sun in morning, and half the time sets after the sun in evening. At some point, I know not exactly when, the current XAU driven gold market will implode, as Exter’s pyramid reaches its natural conclusion. Could be in 2 years, could be in 6 years, or at the latest in 2034. When that happens, ‘gold itself’ will be the only thing that retains real increased value, but that means the real physical gold, in your own possession, or in a non-bank vault. Trading vehicles will just go bust, your counter-party will not pay you, or will pay you in dollars/pounds worth 10% of their previous buying power. Trading gold will be fine for a while, maybe a long while, until this dollar-based debt bubble collapses. If you’re making nice profits with your trading, the investment of a lifetime will be physical gold. 7/3 12:07 Spiral update. Approaching Singularity. The contracting Spiral has created a flat market. Expecting 7/15 high. Targets 2086, 2094-96.
these levels “for weeks”, previously. or exit, gold looks exposed to me. Phil, Greece will neither be bailed out, nor will it exit. Why does it matter precisely how many weeks until gold bottoms, especially to the 3 month window man? Good article, John. 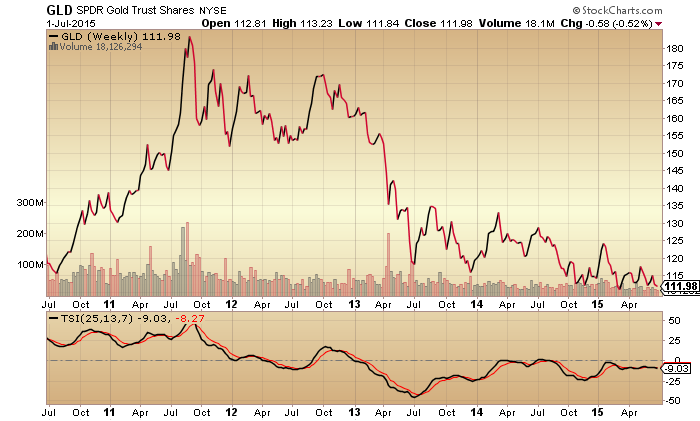 Very interested in the gold sector and appreciate your analysis. Having lost big time in the 2013 decline, I would like to win big time in the 2015 to 2016 rebound. Gann found that 49 to 55 calender days after a major high a panic window may open. When this high was May 20th/21st, we get a window between July 8th and 15th. No guarantees; but a possibility. IMO i think the bottom in miners was November 2014. 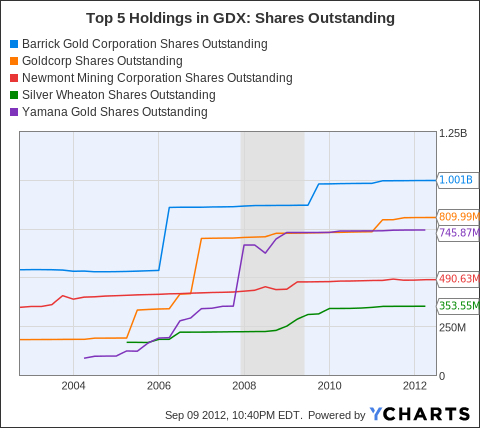 The entire gdx and gdxj float moved in three consecutive trading days combined in early November. Right now bulls and bears are all calling for 1090, 1050, 1033, 1000 and dozens of other targets for gold supposedly b/c they all think we havent bottomed. I think we stay in the 11XXs for a couple more weeks and then we resume upward. OTC gold volume in any currency have been through the roof since September 2014. Yes November 2014 was a bottom, but not of the bear market just important bottom… the rally now will be just wave C of a-b-c , B will bottom in the next few weeks. The bear market will bottom next year. I think both bears and bulls we be wrong and there will be a few left to buy the bottom next year. EW can produce so many different options for markets, so why bother? I do not think that will see the bottom next year because of EW. You are right I can find you a count to justify a bottom. It is because of cycles. It is too early for a bottom. When the stocks plunge lower in 2016 the drying liquidity will take down everything including gold an miners like in 2008. I will entertain your scenario, if it in fact plays out, then to fool the most mkt participants we’d require a breakout to 1400+ in order to convince shorts the “downtrend” is finished and to convince longs that the correction is finished. Then that flushout you outline should take place, but when that run begins it must be parabolic b/c it needs to maximize doubt of a bottom again for longs and it should convince shorts it’s just a quick upside correction before the downtrend resumes. The price must blastoff quick to the 2011 highs in order to leave the most behind and once it’s near 2k no one will have balls to go long. Regardless, i assign a higher probability to carving out a secondary (nov2014 primary) bottom here in the next several weeks. To extend the correction into the summer of next yr would end up being an extraordinary cyclical bear within a secular bull. But Jim Rogers always reminds us that the run of 12 positive years for gold was extraordinary and your scenario would be a nice extraordinary scenario to match the former so its occurence entails a meaningful probability. Yes I know it will be really a long bear market compared with others, but from cyclical point it will be really extraordinary if the bottom was in November 2014. See the new link above for a newer post where I pay more attention to gold and cycles. Short said rounding bottom and only 6 year cycle with 8 years average length this will be really strange and extraordinary. With everybody on the sell side the price will blast higher and squeeze the bears like lemon and bulls burned many times for years will just watch from the sideline scared not believing that it could happen. Your new link suggests stocks to keep running to 2020? 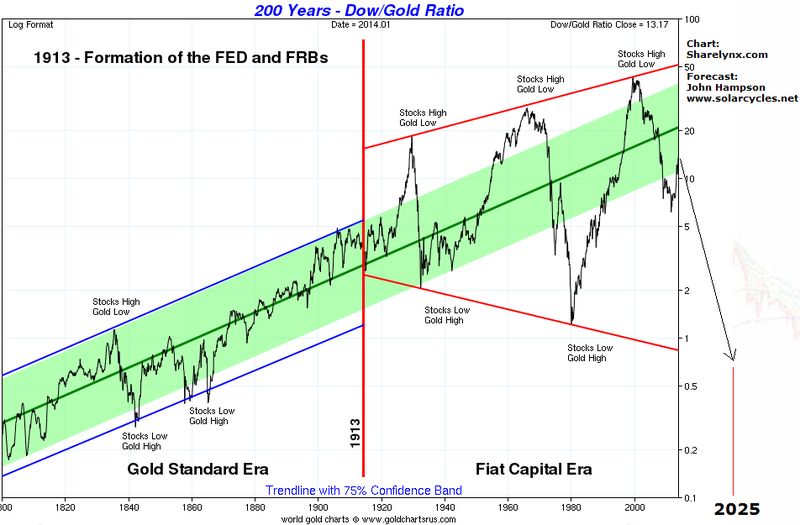 So what kind of Dow:Gold ratio are you anticipating? The two asset classes are orthogonal in secular long term. Only in the sense anything is possible is that guy right. 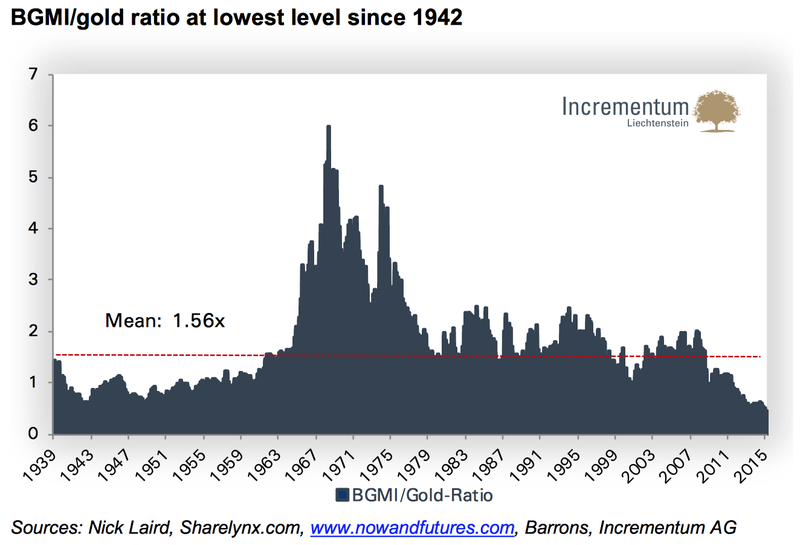 The 1980 peak in gold was spectacular! To call it a one is wishful thinking.The 2 is most probably a 4 and the move from 1998 to 2011 was a extended 5 of an extended 5 of a 55555 since 1932-3 and possiblly 1893. 2011 was a very significant top. Even better with finished 5 waves 2011 a huge correction is running…. which mean I am right:) there will be more to the downside and the bear market is not finished. I am not following him and I do not know what he wrote, just for the first time I see some one writing a descent cyclical analysis and not rushing for the bottom. EW there is always room for interpretation. This five waves could be A and B running now than C and gold going much higher… I will not be surprised. I expect huge run in all assets. Karni David Chapman has not got it right In Dec 2011 he was still bullish on gold. He said there were few signs the bull being over, and shrugged off the obvious bubble top in gold. The worst mistake investors can make is to read a CNBC article and treat it as fact. Same applies to Bloomberg, and many other mainstream media outlets. These sources are stupid and biased, and they want you to believe that everyone is *pumping stocks*, because they are cosied up to the US govt. A bunch of very worried brokers are trying to keep the bubble afloat. Would it be fair to imagine their businesses are threatened if the bubble bursts? The amount of (only large cap) shares they will buy totals around $20billion, including shares in their own companies. Various figures exist on the total value of the Chinese stock market, but It seems to have reached around $10trillion (Shanghai & Shenzhen combined) at the end of May. So, $20b/$10tr, you do the maths, it’s a drop in the ocean at 0.2%. You think that will turn the tide for long, if at all? The original xinhuanet article does not mention ‘China’ or the government at all in regard to this buying of shares. Please continue buying shares if that sentence gives you confidence that everything everywhere is under the control of wise and powerful governments and their minions. I’ll rely on Mother Nature to sort things out. GM I didn’t say this would pump markets up as I did the same calculation in my head and realised how small it was. I’m just interested to see the effect it actually has. I have the same views as you regarding the Chinese bubble. I am looking to see when investors lose faith! I could almost smell your excitement. But it was factually wrong in that ‘China’ has launched nothing. ‘I didn’t say this would pump markets up’. Well, ‘market pumping exercise’ does give that impression you know. GM it is a market pumping exercise in THEIR eyes not MINE. Apart from China I predict we will print new highs on most indices by the end of the year and no bear market will emerge. You have the opposite opinion so let’s see who is right at the end of the year. Dax will be the best performer by far. the only thing we have in common is we know it’s a bubble. It’s just when it bursts where the difference in opinion lies. It’s only a market-pumping exercise in the eyes of CNBC. You shared that link with excited comments about *China*, which was BS (many exclamation marks). But, you know, whatever, I don’t really care, I just call BS when I see it. First serious low will be August 10th, 55 days into the Galactic Year and an important lunar inversion. But acceleration down will get serious after July 27th, driven by moon cycles, the superior mercury sun conjunction and mercury/venus conjunction early august. We are still within orb of the uranus/pluto square and the sun and mars are also within orb of a conjunction. And the sun and mars will be translating (square) the UP square this month. On top of that the new moon on July 16th falls within this period and it follows logically that this new moon will be conjunct mars. That should stir up things a bit. Another date to pay attention to is when Mars leaves its OOB position the 17th, that should also speed up the decline. First Monday low and Wednesday high (one day after 21 days in Galactic Year). Galactic year begins when earth directly passes the Galactic Center in Sagittarius? Is the Galactic New Year the same date every year? The Galactic Year starts when the sun crosses the galactic equator. This equator connects the gate of god with the gate of man. You can see this only in sidereal astrology. Yes, every year June 16th. This year the new moon was exactly the same date which leads me to believe – unlike other people – that the 19 year cycle ended June 2015. Solar declination – the basis for a Gann year – doesn’t make sense in a heliocentric approach. The primary orbit of the sun in the galaxy does. So we have to watch for a high near July 16 -23 after that a serieus decline will start to take form..
Or is a first low between 8-14 July still in the cards? Joseph; one of the most psychologically astute insights Iv’e read in some time. hanging on by a gnat’s eyelash. Im always playing mental chess on how the maximum number of mkt participants can be fooled. I personally loathe these “gurus” , “newsletter whores”, or whatever you want to call them who only present their case as the only case in their subjective probability space. If one doesn’t have a handful of scenarios in their probability space then they aren’t making a meaningful cognitive effort. And for these pricks to go around acting like gurus and charging money and not being sufficiently thought provoking pisses me off. Everyone and their mother for months now has been expecting various valuations for gold below $1,100 and that’s why we will not see those values in the near future b/c everyone expects them. That’s why I like K’s scenario, but it’s not the only one. The other tendency I can’t stand , regarding the discussion in one of K’s links, is this annointing of the 6.5 year cycle, the 7 year cycle, the 8 year cycle, 18 year, and so forth. If such cycles existed then we’d all invest accordingly and be filthy rich. I have a commodities book from several decades ago. I dont have it handy right now but gold’s mean cycle was calculated at about 6.5-6.8 (cannot recall exact value and silver was slightly higher at 7.0-7.2) Anyway i cannot stand this rubbish of very exact discrete repetitive cycles. If they were exact we’d all be rich and we all know that’s not possible. My plan: day trade or swing trade on short side, especially if Monday gaps up. Made a bit on shorting Monday near the open. Reluctant to go short until price reveals something. End of this week, and next week long opportunity. John, I simply do not understand your logic on bad demographics is good for gold? 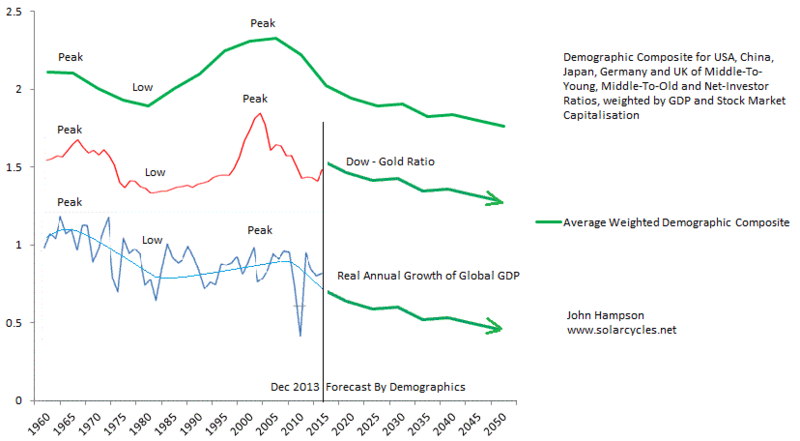 It seems to me bad demographics would be bad for stocks and gold. Kent, gold rises when the system becomes unstable. A system loaded with debt (notably sovereign debt) when demographics means that taxes won’t keep up with liabilities guarantees that the system will collapse at some point, either via defaults, or (in most countries) via currency collapses. Hence gold takes the bulk of money seeking a way through and out the other side. Bad demographics bad for profits hence lower stock prices. Lower stock prices decreased wealth effect middle class. 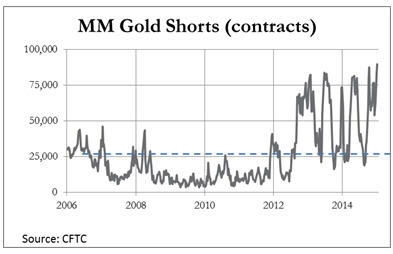 Perfect time to create a bubble in gold and miners when fewest non insiders have capital to participate. I am not a massive fan of ZH but every now and then they uncoversomething that is indeed intruiging. How in hell is this even remotely legal? !……A’la Hunt brothers 1979. Thanks USA for turning the whole global financial market into a total joke! “And also: how is it legal that JPM is solely accountable for 96% of all commodity derivatives while Citigroup is singlehandedly responsible for over 70% of all “precious metals” derivatives? Surely even by the most lax standards this is illegal, but what makes the farce even greater is that all of this taking place out of FDIC-insured entities! Typical ZH drivel, utter nonsense all of it. They are the classic pumpers that simply don’t understand some of the things they read, and spin it as manipulation. A very large majority of gold derivatives are traded via the LBMA anyway, US figures are a sideshow. GM, mate I wouldn’t be too quick to discount the ZH assumptions. I’m still sifting through things to workout what is what but there are a few things that don’t add up. Like I said I don’t give ZH much cred with most things but they aren’t wrong 100% of the time. One answer is that hedgers (both producers and users) as well as speculators/hedgefunds use JPM and Citicorp as brokers. They bundle these and report it under their name. They have legal exemptions issued by the CFTC to do this. So they actually are not really exceeding position limits except to the degree they are cheating. They cheat in other ways such as withholding supply, etc. It is basically just another goldbug argument trying to explain away how wrong they have been for the last 4 years. The world is not ending according to Chris Puplava. Credit markets are not showing the same stress that they did back in 2000 or 2007. No offence but he has his head squarely planted up his …..! Just about every bond trader I know is backing out fast!! How do you make comparisons between 2000/07 and 2014/15 when the later has been distorted via global QE?? Allan, he has a good track record. He called the 2007 a few months before the top. Greek NO vote likely. This will create the best swing trade long opportunity for the dax this year. Will start loading up long first thing Monday if the futures remain this low. Target will be 11,500 initially. On the fundamentals, a no vote equals the start of the end for EZ sovereigns and banks, so run for the hills. Technically, the Dax looks ready to fall to 10k. Wrong this is a bottom, technically the DAX looks ready for 12k and above. Too much bearish bias and emotions…. watch the charts. I’m no expert trader, but this looks like a clear downtrend to me, support around 10k. Love to hear either of you explain why you see otherwise. The Greek drama is just max fear before correction end. The big boys pushing lower to shake out weak hands. Yes the Greek drama is max fear which is what we are at now. Expect a big rebound as usual following these events. The Dow should hit or surpass 18000. The DAX I think will reach 11500-12000 and start the next bull leg to new highs. US markets will probably trend sideways until the respectively cheaply valued Europe catches up. I guess neither of you two perma-bulls have looked at yields and commodities today? It’s fairly clear what’s unfolding, and it has nothing to do with Greece. To all the sad traders who entered the office tonight I wish the best of luck. This is an ” Oh dear” 50/50 moment . GM. i just spent the last day going over details of both aricles, the ZH one that I posted and the PM article youposted and I believe tjat ZH have indeed uncovered some very significant points. It would go a lng way to explain WHY in early 2015 god and silver were on the verge on breaking higher only to suddenly drop dramatically just as the USD were to also decline. It also explains WHY precious metals have failed to react even slightly to the events in Europe. They really want evryone to think that PM’s are NOT any kind of safe haven and t is working judging by some comments from here and eksewhere. Sorry Allan, I’ve read enough about this issue over the years to know ZH don’t grasp much about the gold market. We’ll see gold go through $3,000 soon enough, when market confidence dwindles, all talk of manipulation will vanish then. Same as last time. Red Dog, quite bizarre isn’t? Chinese central planners allow a stock market bubble to unfold and do nothing to arrest the inevitable at any point and then panic when it all goes bad. What in the hell is going on in this world???! I never had much faith in central planners ability to manage global markets but I have to say the events of the last few years has left me with ZERO confidence in their abilities. There is not ONE central bank/government ANYWHERE that has even a modicum of talent or leadership to offer global markets. Nobody ever wants to make the hard decisions required to solve the real issues. This is not true. The Wall Street media want you to believe it though. The central bank is just carrying out normal prudential liquidity operations. It is not supporting or pumping the stock market. *China* has been trying to pop the bubble for months by the way, but bubbles….what can you do? Do not believe media reports (full stop, Western or Chinese). The wheels are coming off, find your own truth, or (potentially) pay a heavy price. There will be tonnes of misinformed comment on Greece and the EZ in the years ahead also. C’est la via. “Do not believe media reports (full stop, Western or Chinese). PBOC policy rate cuts earlier this year is all the PROOF I need that they helped fuel the bubble. They repeated their action twice after they saw the results in stocks first hand after the first time they lowered rates and then repeated it! They were complicit in the bubble FULL STOP! PBOC is no different to any other CB. They allowed a shadow banking industry to explode, malinvestments in property to explode and then overflows into the stock market, only to compound the situtation by lowering rates to alleviate the former two, thus driving the stock market buble further. Then when it all goes pear shaped, they panic by injecting further liquidity. No different than the rest. After years of watching this repeating cycle I was amiss to understand how in hell these people could be so stupid ad repeat this time and again. Specifically regarding China, head over to Jeff Snyder’s blog at Alhambra, search for ‘China’ posts, have a good read, you may develop a more nuanced view. 7/6 10:02 Spiral update – looking for a high @ 7/15 – price target 2139. short term low this am @ 11 ET. Peggy, this prediction can change depending on the market’s behavior, correct? 7/6 16:32 Yes, although the chances for that are small as Singularity was 7/3. The Expansion high is July 18 but the high is expected either 7/15 or 7/22. I’ll update as the uptrend evolves. The new low today changed the outlook to forecasting a higher price than last week’s low. krish/karni, you guys must be sweating tonight if you’re still long the Dax. Good luck. Allan, I’m sure you’ve noticed the past 2 days for HUI. Will 145 be the low again? Or a quick plunge to the 120s? Haha no sweat. investing is not for you if you sweat over positions. No emotions should be involved. 4th time the Dax is testing 10,800. Looks heavy to me. GM as I have said previously, the chart below is the one that I pay most homage to in regards to NA stocks. Also as I noted several weeks ago based on the 30 year seasonal chart of gold we should be entering a period of strength. Last year that situation was completely reversed,(again oddly as gold was breaking out), but I’ll leave that one alone as you suggest. Let’s see what happens this year? Gary, I fully agree with you on the gold scenario. I have been a gold bug for many years, but yet I have not been in any gold stocks or bullion for a few years. 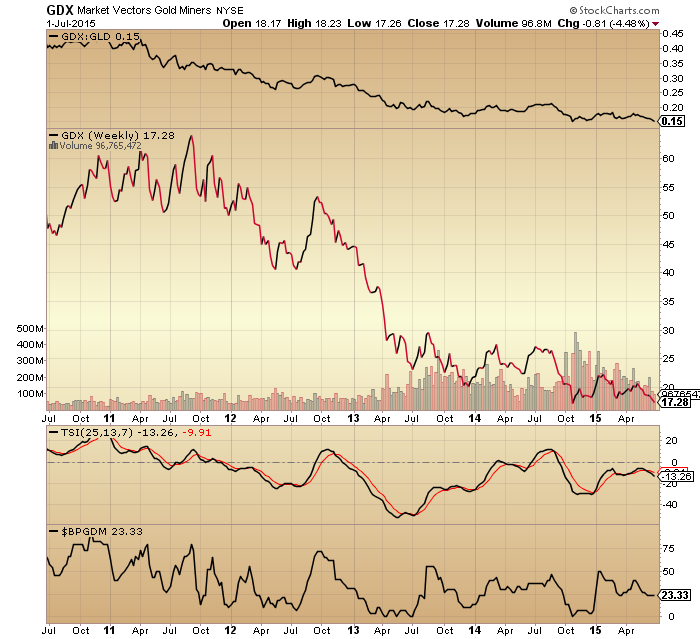 I have been waiting for the gold stocks to take another pounding. Yes the hui will plunge towards the 120 or lower. I am looking for a 18 – 22 % correction in the markets over the next several weeks. I am waiting for one more bounce in our North American markets before layering in the shorts. I don’t really enjoy being the alarmist but this gels with what I posted the other day in response to Duncan. Many of the bond traders I know are backing out fast. Liquidity is drying up and they are REALLY worried. There is nothing that spooks bond traders more than a lack of liquidity:……. German DAX and China, the best performing ones with US markets, are severily correcting….IBB remains the BUBBLE. Who is giving so much confidence to this incredibly overvalued sector? I can smell a waterfall/crash arriving. Just the look of everything: gold, silver, oil, equities, bonds. Looks to me like a big risk-off move. Where’s my mate Allan, with his ‘no deflation and bond yields melt up’ tales today I wonder? Oops, edit, I meant Phil of course. 16 pips til Dr Copper declares a global pandemic: margin calls. 2.384 on the futures,that’s where it bounced in early 2007, nothing below this level but gravity and doom. Copper bounced 3 pips above 2.384, after 8 years, fascinating. To me anyway. (I feel like I am talking to myself!). Dax might catch a bounce at 10,600, lateral support there. Where are all of the bulls? Nic mate, how are you doing today? SPX chart starts to look really ugly. Surely decline today is frightening. Looks like great top MAY finally be in. But it would have been unusual for it to happen before September/October. ES contract chart suggests that today’s decline might be C wave of small abc correction that started yesterday. If we do not take that 2035 level in decisive way then frantic reversal may be in the cards even before close today. For now it looks like retest of bottom at 2035 so let’s see if it is taken or not. Good call on 2035. Now we might fill the gap from late June. Peggy … came across this website >> http://www.oss.cc , peggy is the same author – Steve? it is Spiral based too. no. It’s not the 7442 Spiral. The White House has confirmed that President Obama spoke with Angela Merkel today, and pushed her to avoid Greece leaving the eurozone. Russian fleet prepares to sail? THEN SO WILL THE US 6TH FLEET!!!!!! I was explaining and posting charts the last two weeks…. So, what do you see karni, between here and the end of 2015? Peggy: so the Spiral system would just have one sitting through these huge swings? Does it ever place a stop loss in case it’s wrong? Trading it is up to the individual – fwiw, I use a stop for my swing trades. a good example is the May 10 Singularity to the May 25 Expansion – a couple of good swings in between. PEGGY, APPRECIATE YOUR INFO…….DO YOU HAVE A LONGER TERM FORECAST ON THE SPX…….2-3 MONTHS DOWN THE ROAD???? yes Team Winning. The Spiral expects lower lows ahead in the Aug-Oct time frame. The mid July high will shed some light on price targets for the low. But longer term the Spiral expects 2139 and higher, correct? may have marked a major reversal. 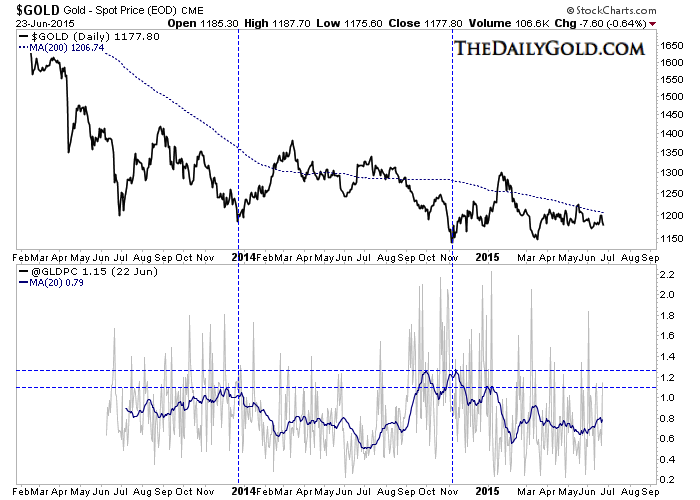 Gold – the bulls have been humbled yet again. You still appear to be dismissive of JH’s fine work over the past 6 months, all of which is proving accurate since Mid-May. How ignorant of you to choose to pretend your own narrative is correct, when the signs were pointed out for readers here by our host. What say you on deflation and bond yields today? Still shorting USTs and long commodities I wonder? Your certainty just last week on those two asset classes would have cost you dear I imagine (if you were trading your views). I assume you never bother to compare gold to all the other commodities? Yesterday was a great day for gold, if you but understood one iota about its value, or how market participants are behaving during a forced liquidation. Starting to think you got this one correct GM. Even US indices are turning down now. You don’t need technicals or fundamentals to lead us down when you have a bunch of incompetent leaders in Europe! I really am surprised how long these guys are taking to sort Greece out but investor confidence is taking a hit. Krish, as I mentioned in a comment to Phil, the evidence of what is happening now has been presented by JH for many months. It started months ago, so one can’t blame Greece or China. The only certainty I know is that you and GM will forever disagree, lol. We both agree a bear market lies ahead! The death of the Middle Class in America could be a major reason why Gold is no longer rallying. China’s stock sell-off is pointing towards Delta’s S+P 500 Super Long Term point six as a high, not a low, and it is due May, 2015. The next Solar Cycle may not have enough “power” to rally stocks up to point 14 due early 2025 unlike what happened in 1929. I an now neutral looking to short stocks. I don’t really want to see a stock/economic crash as I suspect that all hell will break loose on the streets if it does. The US middle class (and all other US & Western classes) haven’t been into physical gold since the 70s, and they won’t get back into it either. It’s a hated asset. Well according to one of our more ‘insightful’ financial newspapers aka The Daily Mail, our dear Chancellor apparently gave the UK Middle Classes a huge tax cut. Perhaps we can help with this gold thingy!! LOL! They know mire lies ahead, but the gravy train rolls on. Yeah, gold thingy, let’s do that. It would appear warning signs are appearing in more sectors. ES contract must be supported at 2035. If violated then it means big bear is taking over and November lows will be quickly revisited. Might want to double-check your open stop orders once this is over…. But seriously, “system software upgrades”?? Mid trading day?? I’m looking at YOU, Bob Pisani…. Jeez…what a tool…. A major gap? Time will tell. I am betting on it. Than slide in to the short side into Aug sept time frame. Unlike Bird Flu the Chinese Flu contagion has never been stopped chemically but has always run its course. Lots of vitamin wave C typically brings relief. It is not previously recorded as being extensively fatal. A hammer shaped candle is known to highlight the probable point of recovery. After effects include general loss of confidence in most everything and frantic dreams of digging for gold. CHINA IN FREEFALL……IT DROPPED ANOTHER 5.9% INSPITE OF THIS!!!! Over 700 Chinese companies have halted trading to “self preserve”. That means about 25% of the companies listed on China’s two big exchanges — the Shanghai and Shenzhen — are no longer trading. COMING TO A MARKET NEAR YOU!!!!! China’s securities regulator has banned major shareholders, corporate executives and directors from selling stakes in listed companies for 6 months, its latest effort to stop the nation’s $3.5 trillion stock-market rout. China WOW to repeat Reb. A 40% drop is a major bear market. But their’s is even worse. Over 2500 companies have not even traded. That should be an interesting opening. Oh no, China no longer omnipotent. The key was Chinese real estate peaked in the middle of last year, now the market has crashed, and coming soon the collapse of the economy should become evident. So why have commodities been so weak? China represented over 50% of world growth. Now, we have bearish Greece, Puerto Rico, and China. QE ended last year. In Japan over the last 25 years, their QE helped the economy, mkt, employment and inflation. But even though momentum continued for several months, they all turned down within a year after QE ended. We are there. Finally, I have noticed a lot of bullishness about Europe and esp the DAX. It sounded logical due to all the bad news. I looked at the long term chart of the DAX and they have had a 6 year bull mkt just like us. Plus, it has a fairly clear 5 wave count up, is rolling over and in position to break below the 200 day moving average. That is a very bearish scenario – Rosey Scenario’s brother Beary Scenario. Hi all ! Hi Valley ! I maintain this is still a bull market. The ECB said yesterday they are ready to increase QE if needed, the chinese central banks cut rates and is willing to support the stock market. In addition, this morning we have a big deal between Celgene and Juno which should drive IBB higher. So, I’m not worried at all. I’m looking forward to new all time highs shortly. Another nice day for those long USTs too Phil. Message for jeger….never got round to congratulating you on nailing the China top, I wonder if you’ve been short through the crash? Hope so. Message for Nic….. 😉 Chin up, keep smiling, and press that sell button to ease your pain (before everyone else does). Planets: super bearish Venus inferior conjunction 8/15; bullish V/M helio conj 7/18; bullish M superior opposition 7/23. Summary: went long today near the close. Hoping for bounce up tomorrow and into favorable new moon next week. Convergence of negatives appear end of next week, moon phase goes negative, apogee weak zone, seasonals change to negative. Will probably get stopped out tomorrow and sit on hands until after new moon. Message for Nicolas: please refute those who don’t understand the CB equity perma bull thesis; if you are correct, now would be the time to be fully invested as prices have been taken down to yearly lows. I understand the CB equity bull thesis valley, but consider it nonsense. “Over 700 Chinese companies have halted trading to “self preserve”. The trick is to find a new thesis ~before~ a bad one blows up in your face…. Time will tell. Nicolas has been on the right side of market movements since he has been posting and only the last few months does it look like his buy and hold strategy may be in for a corrective phase. Kudos on your success with market timing Barry. Whatever a person’s thesis is, as long as it keeps you long, while the market goes up, may seem like it’s a good or correct system/thesis (rationale for being long, in this example). I mean, I could say my reason for staying long is…..the sun comes up in the morning….. The sun’s up this morning?? Check off the box, and stay long the market another day…. And dang if that ole’ “Sun Up, Market Up” system hasn’t been paying off…in spades….for several years now…. If The Fed, or any other CB in the world could just keep markets always going up, wouldn’t 1973-74, 1987, 2001-02, and 2008 ~not~ have happened?? And yet……the Fed was around then, and…..they did…. How could that be? Never seem to get a good answer to that one….. Regardless, thanks for the kudos…. Fair to say, I’ve had a pretty terrific last couple of weeks here, but until a few weeks ago, this whole year has been nothing but wasted time and trading money back and forth…. Whole lotta “nuthin”…..
Nicolas recommended buying BHP @ $49 now $37. RIO @ $46 now $38 just for starters. Yep always on the right side??????! Given all the outages yesterday (NYSE, United Airlines, WSJ) would anyone know if we had one of those CME things hit us and cause this? Just interested whether there was any extra terrestrial reason. Chinese plitburo have completely lost the plot? I am gobsmacked by their decisions of the last 12 months….GOBSMACKED!! China is headed for meltdown unless they can begin making solid proactive decisions. Banning large shareholders from selling is NOT a wise move. I agree government is clueless, give me an anarcho-free market system and I’d be happy. The bigger problem is that government is composed of humans, and humans are erratic and emotional and driven by evolutionary desires to survive at the expense of fellow humans. I think we close the gaps now, or try to, I’d be loading up on shorts after a day or two. It looks like ES contract may retest 2075-2080 resistance today. We will probably break out of this 2035-2080 range on Monday with “final” decision” on Greece. Excellent commentary John. Enjoy reading your blog.